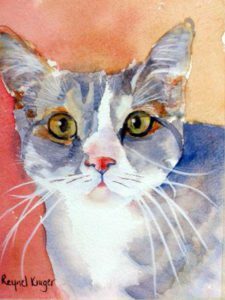 I had the privilege to also paint Sparky in watercolours during the 30 kitties in 30 days. Sadly she passed away last week and was cremated yesterday. She had the best human mom any kitty could have wished for and her mom is heartbroken. My first love was watercolour paintings. I loved the transparency and fluidity and I am still drawn to it although I hardly ever make any watercolour paintings these days. This is Faith and she is one of my favourites of the 30 in 30 days. 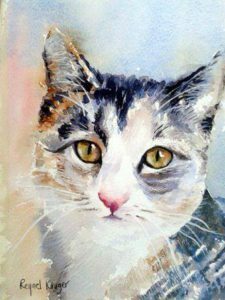 I do commissions, so you are welcome to contact me if you want a portrait of your kitty. 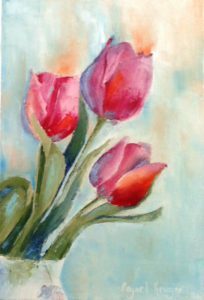 I made three tulip paintings with oil paints and my trusted little palette knife. I experimented with a different blue for the background than what I normally would have used was very pleased with the end result. 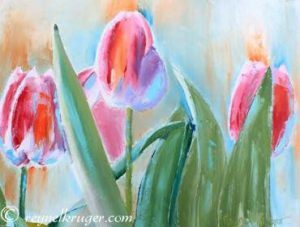 The shape of tulips are so uncomplicated and yet so pleasing to the eye. This specific shade of tulip is my favourite. I have never been to tulip country but would love to go. It seems that I am a colour junkie. Do you agree? 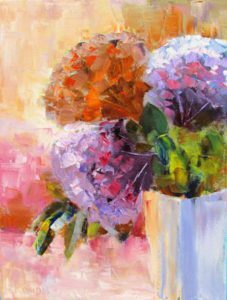 The hydrangeas were painted with a palette knife and oils on blocked canvas. 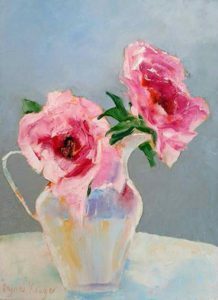 I wish I kept the painting for myself as it is one of my favourite floral paintings ever. Before I started painting I was really scared and wondered if I could pull it off. There were so many petals! Fortunately it worked and I am very happy with the end result. To go to my available paintings, click here. This colourful soft roses pops against the calm background. I played with colour on the white vase as well and the shadows on the tablecloth are soft. At first I gave it a busy background but changed it. I like it much more this way. 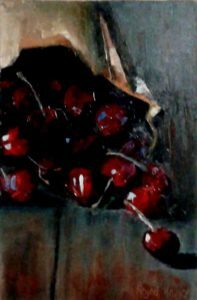 I painted it a few years ago and it is in my personal collection. This painting makes me so happy. I love the colours on this one and painting it was so easy. Don’t you just love it when it happens?